worthy citizens of Scotia, Nebraska, having been connected with mercantile and banking busness; and he is one of the public spirited men of this section of the country. Frederick Wichman, as the subject of this review is known, was born in Ashton, Sherman county, Nebraska, September 1, 1882, and was the only child of Fred and Isabelle Wichman. Mr. Wichman is a Nebraska boy born and bred, growing up on the home farm until his sixteenth year, receiving a good common school education. in his eighteenth year he attendcd business college in St. Paul, Nebraska and after completing his education he worked fot the Keystone Lumber company at Ashton, later was in the employ of the general mercantile firm of Taylor at Ashton, and Hayden at Omaha; and until 1904 was an employee of Hayden Brothers of Omaha. In 1905 Mr. Wichman went to Farwell, Howard county, and became connected with his uncle, Joseph Wichman, in the mercantile business, and remained there for two years. On May 15, 1908, the First State Bank of Scotia, Greeley county, was organized with the following officials: N. J. Paul, president; W. L. Little, vice president; R. F. Wichman, cashier and resident manager. The bank was sold in February, 1911, since which time Mr. Wichman has been the local representative of the International Land Company of Omaha. Mr. Wichman is a young man of splendid business ability and is a progressive man along all lines. The Wichman family is well known in central Nebraska. Grandfather and Grandmother Wichman reside in Farwell, Nebraska, the oldest couple in point of years in this section of the state; Grandfather Wichman is in his ninetyfifth year, and his wife in about her ninetieth year. They are still active and enjoying life to its fullness. Our subject's father died in 1905, in Nebraska, and the mother is now a resident of California. Randolph Frederick Wichman, the principal subject of this sketch, was married to Miss Jennie Armstrong, daughter of Irvine and Annie (Welsh) Armstrong, at the Armstrong home, September 1, 1908. A son, Frederick Irvin Wichman, was born May 18, 1911. Mrs. Wichman was born in Howard county, and her parents are old settlers of Nebraska. Mr. and Mrs. Wichman enjoy the respect and esteem of a large circle of friends by whom they are surrounded in their pleasant home. They are members of the Methodist Episcopal church. In politics Mr. Wichman is a republican; he is a member of the Masonic fraternity and of the Independent Order of Odd Fellows. Among the proniment pioneers of Howard county, who are now deceased, we mention Rasuus Mortensen, whose name heads this review. He was a man of untiring energy upright character, and for many years was known as a progressive business man of his vicinity. Mr. Mortensen died on November 20, 1899. 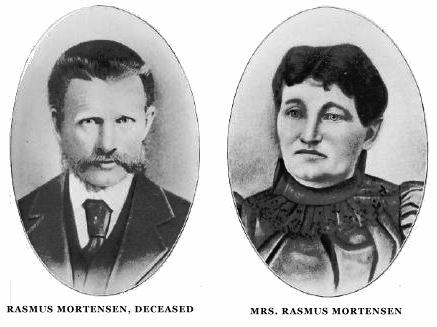 Rasmus Mortensen was born in Denmark on November 27, 1846, and his boyhood was spent on his father's farm. In his boyhood he was apprenticed to to a miller, and learned that business thoroughly. He was married at the age of twenty-four years, to Josephine Neilsen, also born and reared in Denmark and one son was born to them. In 1872 he brought his little family to America, joining the Danish colony which had been established in Howard county, and in partnership with Peter Hansen, purchased homestead rights of Paul Anderson, this land situated six miles northwest of Dannenbrog, the consideration being $1,000. After acquiring this property the joint owners ''drew straws'' to decide which one should live on the place, our subject being the fortunate man, and his partner immediately filing on another homestead near by, together carrying on both farms, each furnishing part of the equipment necessary and dividing the work between them. Mr. Mortensen was successful in developing his farm in good shape and accumulated considerable property, although he in met with the usual obstacles during the early days. He became interested in the milling business at Dannebrog for a short time, and at the time of his death was owner of six hundred and eighty acres of fine farming and graziug land. Mr. Mortensen was a staunch democrat, and took a deep interest in the polotics of his county and state, although never sought public preferment. near Farwell, in Howard county; Lillian M., wife of Wesley Scott, farmers near Palmer, and Minnie M., also remaining at home with her mother. The entire family is well known and highly esteemed, being numbered among the representative pioneer citizens of their county. We are pleased to present portraits of Mr. and Mrs. Mortensen on another page of this volume. Rasmus Mortensen, Deceased. -- Mrs. Rasmus Mortensen. Hiram E. Colborn, residing in Palmer, Merrick county, Nebraska, is one of the oldest settlers in eastern Nebraska, and by his efforts he has aided materially in the development of the agricultural and commercial resources of his county. Mr. Colborn is a gentleman of most estimable character, highly respected in the community and one of the leading old-timers of the section. Mr. Colborn was born in Sauk county, Wisconsin, December 11, 1855, and was fourth in a family of Abram and Mary (Comfort) Colborn, who had seven sons and four daughters. Mr. Colborn was a farm boy, and in the fall of 1876 he came to Merrick county, Nebraska, taking up a homestead of one hundred and sixty acres on section twenty, township fourteen, range eight, where he and his family have lived continuously all these years. This farm in now finely equipped, and a comfortable home is built thereon. Mr. Colborn was married to Miss Mary Goodrich, on the Goodrich farm in Merrick county, March 3, 1886. The Goodrich family came to Merrick county in 1872 and were a prominent pioneer family. Mr. and Mrs. Colborn have seven children: Benny, Mary Gertrude, wife of Lowell Smith, of San Francisco, California; Lysle, Etoile, Avery, Katie, and Jessie, all of whom are living under the parental roof, except Mrs. Smith and Benny, both of whom are in California. Mr. Colborn and brothers, John and Benjamin, reside almost on adjoining farms. The Colborn family for over thirty years have been prominent in this portion of Nebraska, and have been strong factors in building up and making this section the improved and advanced country it is to-day. No family, either foreign born or native, has left a deeper impress in the financial and business institutions of Cedar county than that of the Lammers, John Lammers, father of A. K. Lammers of Hartington, first came to Nebraska in the spring of 1861, and from the beginning gave evidence of unusual financial and business acumen. He was frugal, industrious and honest, a triology of virtues that made him the most successful man the county has ever known. John Lammers was a native of the kingdom of Hanover, born July 5, 1839, and came to America in early life. He came up the rivers to Cincinnati, later resided in Dubuque and Davenport, where he had been living some years when he migrated to the plains of Nebraska. Ten families formed a colony and drove through Iowa with ox teams; crossing the river at Sioux City they diverged to West Point, but made no settlement until reaching St. Helena. Mr. Lammers filed on a homestead in the Bow, near St. Helena, Nebraska, and later a timber claim; these tracts were the nucleus of an estate that amounted to upwards of three thousand acres before he was stricken down in 1896. He was interested in business enterprises of various sorts, and his financial ability made them a success. He was married to Miss Mary Stratman, a native of Westphalia, and to them were born eleven children. Anton K. Lammers was born in Cedar county, Nebraska, June 23, 1871, and attended the country schools during the short winter terms. He attended the Hartington schools one year, and the following year, the winter of 1886-7, took a course in the schools of Quincy, Illinois; the winter of 1889-9 he attended a commercial college in Omaha, fitting himself for a postion in the business world. His father had taken an interest in a lumber yard in Hartington and Mr. Lammers became one of the office force. In 1895 the firm was dissolved and the business continued under the firm name of J. Lammers & Son; after the death of the father Mr. Lammers purchased the mother's interest in the estate, and has since conducted the business under his sole management. He carries a full line of lumber, together with paints, oils, brushes, etc., and other timber accessories. His genial nature and square dealing win for him a good share of the trade of Hartington and the surrounding country. Mr. Lammers was married in Hartington, May22, 1900, to Miss Clara Walz, a native of Iowa. Her parents, Anton and Dorothea (Kruse) Walz, are natives of Germany. They came to America and settled in Iowa for a number of years, then came on west to Nebraska. To Mr. and Mrs. Lammers three children were born, namely: Eurelia, Gertrude, and Dorothy. Mr. Lammers has a vivid recollection of some of the blizzards of the early years; in that of October 14 to 16, 1880, he had ridden his pony over to a married sister's, and the storm breaking, he was compelled to remain there three days; had there been telephones in those dayss, he could easily have relieved the anxiety of his parents; as it was they had to rest contented with the thought that he was safely housed. In that short, sharp storm of Janary 12, 1888, in which so many lives were lost, Mr. Lammers happended to be in town and kept within doors until the storm abated. found on Antelope creek; wild turkey frequently formed the main part of prairie banquets in those days, and nothing in later days can surpass the dinners served when Cedar county was on the frontier. For two seasons his father's crops were devastated by grasshoppers, and young as he was Mr. Lammers well remembers their flights. Mr. Lammers has inherited a good name from a worthy sire, and well is he upholding it. He is recognized as one of the substantial and progressive business men of the county, and with his family holds a prominent place in the social life of his home town. Mr. Lammers has been a life-long democrat, is a member of the Catholic church, and of the Knights of Columbus. Among the leading old settlers and public spirited citizens of Knox county, Nebraska, the gentleman above mentioned deserves a prominent place. Mr. Schuett has aided in no slight degree in building up the schools and commercial rebources of this region, and has done all in his power for the betterment of conditions in his community, socially and politically. Mr. Schuett is a native of Germany, being born in the province of Prussia, April 26, 1847. He is the son of John and Bertha Schuett, both natives of Prussia, who died in their native land. When but nineteen years of age, Mr. Schuett came to America, and after landing in the United States, went to Wisconsin, where he remained for six years, having been married in the meantime. In 1872 Mr. Schuett, with his family, drove from Wisconsin to Knox county, Nebraska, taking up a homestead on section thirty-two, township thirty, range five, and four years later a timber claim on section twenty-nine, township thirty, range five. They first built a dugout in which the family lived three years, and then built a good frame house. During the first years of residence in this section of the county. Mr. Schuett and family experienced many hardships and failures. He suffered losses through the grasshopper raids in which the entire crops were destroyed, and in 1894 the drouth destroyed all the crops, the hot winds burning them in the ground. Mr. Schuett now owns eight hundred and eighty acres of well improved land, and has twenty acres of fine trees, some of which is a good orchard. Mr. Schuett was united in marriage June 18, 1868, to Miss Bertha Neno, and Mr. and Mrs. Schuett are the parents of three children, named as follows: Robert, who is married to Miss Minnie Wenters; William, married to Miss Minnie Gustman, and Tillie, who is the wife of Henry Kriemeier. In the person of the gentleman above mentioned we have another of the prosperous and successful farmers of Nance county who is now retired from active labors Mr. Ludington is one of those substantial citizens whose integrity, thrift and economy have added largely to the material wealth and growth of the state of Nebraska. Agriculture and stock raising forms the basis of weath and prosperity in the west as, indeed, in most sections of the United States, and it is, therefore, of great importance that the class of people who inhabit the farming regions of the country should represent those elements of sterling worth so prominently displayed by the pioneers of a great west, and which we find in the largest measure in our subject. record for promptness and strict attention to duty. Mr. and Mrs. Ludington have had six children, as follows: Luella, who married Samuel Pritchett, mother of five children, residing in Cody, Wyoming; Mary E., wife of James Russell, parents of three children, making their home in Fullerton; Kate, wife of Edwin Russell, they having three children, also living in Fullerton; John N., married and living with his three children in Cushing, Nebraska; Mattie, wife of Wallace Gorby, mother of two children, residents of Nance county; Ida May, wife of Bob Dopf, the latter editor of a local paper in Belgrade, Nebraska, where they make their home. The family are all well known and enjoy a large circle of aquaintances in this section of the state. They have all passed through the pioneer experiences, meeting all the discouragements and trying times in establishing their home, and during the years of the grasshopper raids throughout the country were compelled to depend entirely upon their sorghum factory for their living as the pests swept their crops completely away. Mr. Ludington has at different times held local office, and exhibited a truly public spirited view of affairs in his county and state. He is a verteran of the civil war, having enlisted in Company K, Fifteenth Iowa Regiment of Infantry, in 1864 and was with the Seventeenth Army Corps, surving until the close of the war. He saw much hard service, and received his honorable discharge at Davenport, Iowa in June, 1865. He was with General Sherman on his march to the sea and took part in several egagements. He participated in the grand review at Washington, D. C., at the close of the war. That success be won in the golden west if one but has the energy and perseverance to take the hard knocks that come his way, make the best of them, and keep on trying, is fully proved in the career of A. L. Stearns of Spencer, Nebraska. Mr. Stearns was early thrown on his own resouces, having made his own way since the age of eleven years. Mr. Stearns was born in Blue Earth county, Minnesota, December 1, 1879. His parents were also natives of that state and came to Nebraska in 1890, settling on a homestead near Spencer, and it was at about that time of their removal here that the boy started to support himself by working on farms and ranches. He was at various times employed around livery barns caring for horses, and in this way became thoroughly familiar with every detail of the livery business, at which he has made such a success. During 1904 he located in Gregory and Dallas, South Dakota, for three years running a livery barn in both towns, returning to Spencer in 1910. Here he purchased a well equipped livery establishment, built up a good trade, and through strict attention to business, a thorough knowledge of the country and splended ability in his line of work, he became one of the dependable men of his community. February 25, 1911, he sold his livery business, since which time he has been employed by Dr. H. A. Skelton. Mr. Stearns was married in Hurley, South Dakota, November 20, 1903, to Miss Mina Pelmulder, and to them have been born three children, namely: Carmon M., Richard F., and Harrold. They have a very pleasant and comfortable home, and are worthy members of society, having a host of warm friends in Spencer and vicinity. Mr. Stearns has always been a staunch republican. He is a member of the Woodmen of the World, and the National Benevolent Society of Spencer. The greater part of Mr. Stearn's life has been spent in the frontier countries. While living in Minnesota wolves were plentiful, the big grey wolf, black wolves and numerous coyotes being found in considerable numbers in their section. Also, black bear were occasionally killed, while deer were not infrequently seen. At times the family had as a dwelling the primitive dugout and sod house. They knew privation and hardship, as did most of the pioneers who pushed out west from the far eastern towns and thicker settlements, but were of a hardy stock who never let trifles bother them, and kept happy and light hearted through trouble and discomforts. William W. Havens, now deceased, for many years a well-known member of the farming community of Boone county, departed this life on March 18, 1907. He was born in Cleveland, Lincoln county, Ohio, July 1, 1827, a son of Jesse and Rebecca Havens, the entire family settling in Illinois, where he grew up and was educated. He was married on October 14, 1847, to Mary Ashburn, of Tennessee, and the first several years of their married life was spent in Illinois, they going to Iowa in 1853, where Mr. Havens followed farming for about twenty-four years, he being one of the pioneer farmers of their section of Iowa. of whom appears in this volume; Isadore, who married George Whiting and lives in Albion, and William L., of Loretta. Mrs. Havens occupied the family home in Albion until the advanced age of eighty-two years and died October 30, 1910. Her brother, James Ashburn, lives in Spencer, Iowa. While Pennsylvania has not contributed so much to populating the west as New York and other eastern states, the sterling sons of the Keystone state who have come here have made their presence known. David Cunningham, retired, of Wayne, was born in Juniata county, Pennsylvania, December 16, 1838, and was reared in his native county. Of the ten children born to David and Agnes (Lyon) Cunningham, David, junior, was ninth in order of birth. On attaining manhood, he married and began farming in Juniata county, in which calling he was engaged at the time of his migration to the west in the spring of 1882. Coming to Marshall county, Iowa, he rented land for a year, and in the fall came out to Nebraska selected and purchased one hundred and twenty acres of land three miles southeast of Wayne and returned to Iowa for the winter. In March, 1883, he came into possession of his new purchase, to which he later added one hundred twenty acres, making a farm of two hundred and eighty acres of as fine land as any that lies in the west. He gave his principal attention to stock farming, buying instead of selling grain, thereby adding to the fertility of the land instead of depleting it. For over twenty years he resided on the place, erecting good buildings sheds and fences, planting orchards and groves. In 1904, he built a large eight-room dwelling on the north hill in Wayne and furnished it in keeping with his surroundings; here he is enjoying the case and comfort earned by a well spent life years of toil in his earlier days and of unceasing thought in the management of his stock and farm. Mr. Cunningham was married in Lost Creek Valley, Juniata county, Pennsylvania, February 14, 1862 to Miss Virginia Reynolds Christy, also a native of Juniata county, and daughter of John and Mary (Reynolds) Christy. To Mr. and Mrs. Cunningham have been born eight children, five of whom are living: Kate, wife of W. H. Gildersleeve, lives southeast of Wayne; Lillie, wife of Charles Gildersleeve, who is farming nine miles southeast of the county seat; Ellen and her busband, Reverend Charles D. Gearhard, a Congregational minister, live in Burwell, Gaifield county, Nebraska; Lloyd lives in Marion, Kansas, where he fills the pulpit of the Presbyterian church; and William, the youngest occupies the old home farm. The children who are deceased are: Edward Holmes, David Ross, and Virginia May. Mrs. Cunningham's death occurred March 27, 1911. Leaving a young wife when the life of the nation was imperiled, Mr. Cunningham enlisted August 25, 1864, in Company B, Two Hundred and Second Pennsylvania Volunteer Infantry, and saw service in Virginia. His regiment was employed mostly in guarding the railroad to keep open the line of supplies, heading off Early and keeping Moseby and his guerillas on the move. Part of the time they were on duty in the outer defenses in Washington, and were at Fairfax when the joyful news of Lee's surrender reached them; and here, too, the sad tidings of Lincoln's death was read to the regiment, by the colonel, from the first paper that found its way into camp. He was in service until August 3, 1865, when he was discharged and sent home to his family. Mr. Cunningham soon adapted himself to the west, which in spirit and custom is so widely different from the east. The latest of the notable blizzards swept the west since Mr. Cunningham settled in Nebraska, that of January 12, 1888. Two of his sons were at school, and as he was contemplating going for them, William came in, having ridden to a neighbor's in his sleigh, and then found his way home along the willow grove. Lloyd remained to come home with the teacher and later found his way home in the same way, but until both were beneath the roof it was a source of distress and worry, so severe was the raging storm. Mr. Cunningham has witnessed some of the destructive hail stornis that have pelted the plains, and has seen a promising crop of corn cut to the ground in a short space of time. Nothing but praise for the west is Mr. Cunningham's sentiment for the land in which he has prospered so well and in which he has found so many cordial and congenial neighbors and friends. Mr. Cunningham is a member of the Presbyterian church and of the Grand Army of the Republic. He is affiliated with the republican party. Charles Buche, residing on section fifteen, township twenty-seven, range five, Antelope county, Nebraska, is regarded as one of the leading citizens of his locality He has always been one of the important factors in the upbuilding of his region, aiding materially in its development and growth from the time of its early settlement. Charles Buche was born in Kankakee county, Illinois, November 13, 1872 and was raised by his grandparents, John and Margaret (Frahm) Buche both natives of Germany. The grandfather was born in 1822 and died in 1903; and the grandmother was born in the year 1824 and died in 1897.
left Germany and came to America and lived in the state of Wisconsin a short time, thence moved to Illinois, and in the year 1885, Mr. Charles Buche came to Antelope county, Nebraska, where he bought one hundred and sixty acres of land in section three, township twenty-seven, range five, which he highly improved and then sold it and went back to Illinois. Our subject's father served three years and three months in the civil war, enlisting in Company D, Forty-third Illinois Regiment, and during his participation in said war received a slight wound. Charles Buche, our subject, was married in 1893 to Miss Alberta Hayhurst, and they are the parents of three childien whose names are as follows: John Clayton, Hilda Lenora and Edith Alberta. Mr. Buche returned to Antelope county, Nebraska, and bought one hundred and sixty acres of land in northwest section fifteen, township twenty-seven, range five, his present home. He has four acres of fine trees. Mr. and Mrs. Buche enjoy the respect and esteem of all who know them. Among the leading old timers in eastern Nebraska who have succeeded in accumulating a good property by dint of industry and honest dealings, supplemented by thrift and good management, the gentlemen whose name heads this review deserves special mention. He has been closely identified with the development and upbuilding of the region where he lives, which is in section twenty eight, township twenty-seven, range two, Pierce county, Nebraska. Mr. Feddern is a native of Germany, born in the village of Goetzberg, province of Holstein, January 12, 1868 and is the son of Hans Feddern, who was born in 1832 and served in the Danish army in 1850 and 1851. The mother, Katie (Steinbach) Feddern, was born in 1842. The father came to America in 1880 and after three years' work near Omaha, sent for his wife and son. They sailed from Hamburg to New York on the "Fresia," the voyage lasting ten days. The father rented for nine years and then had a farm of his own. When Rudolph Feddern started out for himself, he rented for four years seven miles south of Randolph, Nebraska, and in 1891 bought the land where he resides at the present time, owning a well improved farm of three hundred and twenty acres, on which are planed two acres of fine trees. The house and other buildings he erected, and made many other improvements on the place. In the spring of 1897, Mr. Feddern was married to Miss Henrietta Isenblatter, and to this union five children have been born, whose names are as follows: George, Adolph, Herbert, Luella and Rosa. Mr. Feddern came to this region in its early days of development and has passed through all the strenuous Nebraska times, becoming by his labors in behalf of his adopted state one of the leading citizens and well known supporters of all that goes to make the locality a prominent section in the eastern part of the state. H. A. Ellis, now deceased, was during his life time a prominent citizen and one of Howard county's early settlers, who through his personal aid and influence helped in a large measure to make of that region the thriving and prosperous community it has now become. Mr. Ellis was born on August 2, 1823, on a farm near Syracuse, New York. He started working for himself at an early age, taking up his work in the lumber regions of Michigan, where during his younger days he was known as the greatest sawyer on the Grand river. He was married there in 1850, to Jane E. Briggs, and they remained in Michigan up to the fall of 1865, then removed to Iowa, settling in Rising Sun, where our subject became interested in the mercantile business for one year and then purchased and moved onto a farm. He resided there for eighteen years, at which time, in 1884, the family came to Howard county, Nebraska, Mr. Ellis purchasing a farm on Canada Hill. This he operated for a number of years, but always resided in the city of St. Paul, which was his home until his death on December 30, 1890. He was a man of exemplary character, industrious aud progressive and succeeded in building up a nice home and competence, enjoying the highest esteem of all who knew him. years, she regularly prepared and read interesting papers on various subjects before different clubs and societies. Mrs. Ellis was also a poetess of more than ordinary ability, and a number of her efforts have appeared in print, and won for her much praise. She was a charming woman, and was beloved throughout the region for her bright and happy disposition and her kindness to all. Viggo Muller, a progressive farmer and ranchman of Valley county, Nebraska, resides on section twenty-nine, township twenty, range fifteen, where he has a good home and farm, and in 1910 built a fine new residence. He is a young man who has a promising future, and bids fair to emulate his father before him, who was one of the highly esteemed old settlers of Valley county. Mr. Muller was born in the village of Brostrup, province of Schleswig, Germany, July 15, 1874, and is fourth of five children in the family of Jess L. and Johanna (Schmidt) Muller. He has two sisters and one brother in Iowa, and one brother in Minnesota; the father died in Valley county, Nebraska, in 1904, and the mother in 1909 in Iowa. In 1885 Mr. Muller came with his parents to America, sailing from Copennhagen, Denmark, in the steamer ''Eisland,'' landing in New York after a voyage of fourteen days. Locating in Valley county, Nebraska, the father bought one hundred and sixty acres of good land; on which our subject grew to manhood, receiving his education in the local schools, and later engaged in farming. In 1904 Mr. Muller purchased the old home stock and grain farm of one hundred and sixty acres in section twenty-nine, township twenty, range fifteen, where as before stated, he is now residing. Mr. Muller is one of the younger men among the early settlers coming from one of the well-known families of the county, and is widely and favorably known. He is a progressive man of affairs, always taking keen interest in matters pertaining to the welfare of his home state and county. On August 24, 1910, Mr. Muller was married to Miss Marie Kappel, a native of Denmark and daughter of Jens and Marn (Nielsen) Kappel, who came to America in 1906. Mr. and Mrs. Mu1ler have the good wishes and respect and esteem of a host of kind friends and acquaintances. They are the parents of a son named Jess, for his grandfather. Mr. Muller was reared in the Lutheran church, and is independent in politics. At the time of the blizzard of January 12, 1888, Mr. Muller was at school, which was dismissed at three o'clock, the children making their way home in the storm. He well remembers the cyclone of 1885, which wrought such great havoc in Valley county. A sod house was the first dwelling, to which a frame addition was built in 1887. This was moved to a new site in 1910 and a large frout built to it, making a very comfortable modern house. Rufus George Carr, a portrait of whom is presented on another page, was one of the very early settlers of Custer county and is one of the best known men of central Nebraska. He is a prosperous and successful business man and has built up several local enterprises, in some of which he still has an interest. He was born in Redfield, New York, September 7, 1836 eldest of the seven children of George R. and Mary (Dickinson) Carr. He has three sisters now living in Nebraska: Mrs. Ida Phelps, Mrs. James Benedict, and Mrs. Harriett R. Peters; another sister, Mrs. Sarah Whiting, of Lois Banis*, California. The father was born in Oneida county, and the mother in Oswego county, New York, and both died in Custer county, where located in 1878.